Q – What would you recommend as a supplement that works best for a yearling with a severely swollen hock! It was x-rayed; no breaks or bone chips. Was on an antibiotic for two weeks now. Swelling has gone down but she’s still really lame. Anything you can recommend that would help? Worried about her guts too as she was on Bute for 5 days and an antibiotic of 24 pills a day for two weeks? She will not tolerate stall rest. She is so bad in the stall twisting and turning on it trying to find a way out. Q – I have a mare with the horse version of PTSD. She was in her paddock when a truck crashed into a tree about 40 feet away from her. She hasn’t come down from her “flight” mode now even 3-4 weeks later. She did break the tip of her tail during the accident, probably spooking into a pipe rail. I am wondering if there is any kind of holistic or homeopathic treatment for this kind of problem? A – I would suggest the homeopathic remedy, Aconite. Get as high a potency as you can and give it twice a day for up to 3 doses. My mule had a very similar experience after she had a surprise encounter with a neighbor’s llama. The aconite did the trick. If this does not help, then let me know. Q – Have some questions about you using sand as you mentioned in your last newsletter article. How deep did you make the sand footing? Any concerns about them eating sand? You could put pea gravel down but that is very expensive isn’t it? A – I made the sand about 4 inches deep. It is very coarse river sand with lots of gravel in it. I feed the horses on mats. I should have mentioned that but I have not found coarse sand to be a problem. The powdery sugar sand is more likely to be picked up because it sticks to the feed and hay. I feed my horses these probiotics mixed with algae every day and this helps them have healthy motility in their intestines to move out any ingested dirt or sand. 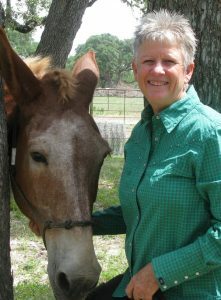 This entry was posted in General Horse Care, Horse Health Care and tagged feeding horses, holistic horse care, holistic horse health, horse, horses on November 22, 2016 by Madalyn Ward, DVM.